Can you believe it thinking about Christmas already, i would have said “the c word” but there are 2 meanings to that haha i dont want any confusion haha. I was lucky enough to attend the launch of the Christmas collection from Lush and get to see the products in action and hear all about them but best off i had the best hand and arm massage ever! i was so wound out after trying to make it to the event after college got there a little late but then was treated to this massage and i was actually in heaven! Then we have Dashing Santa Bath Bomb (£2.95*) which is so cute, i think Lush brings out the best Christmas bath stuff simply because they are all just so cute you dont even wanna use them because of that. Dashing Santa contains the cheerful and uplifting scent of satsumas at Christmas. Watch Santa fly about your bath as his golden boots fizz away, releasing toning mandarin oil, bergamot oil and orange flower absolute that help put a spring in your step. I really like Dashing Santa because it really does remind you of Christmas when you’re younger when you get an orange in your stocking haha, what i really like it Lush always plays on your sense of smell it reminds you of things and it almost like the scents pull back memories and make you feel all warm and fuzzy! Lastly we have Sparkly Pumpkin Bubble Bar (£3.50*) which isn’t for Christmas but for Halloween, its insanely glittery which for me is like so cool but it gets everywhere what i like about this glitter is it isn’t plastic which is fantastic because they are made of synthetic mica, which is made up of natural minerals, so instead of filling your bathroom with plastics which won’t biodegrade and are potentially toxic to marine wildlife, you can sit back and enjoy your bath, safe in the knowledge that it won’t have a negative impact on the environment. Sparkly Pumpkin smells amazing it contains the energising blend of juniper berry, lime and grapefruit oils packs a punch. I always wondered what you would look like after using this in the bath would you be covered in glitter and have to wash it off? 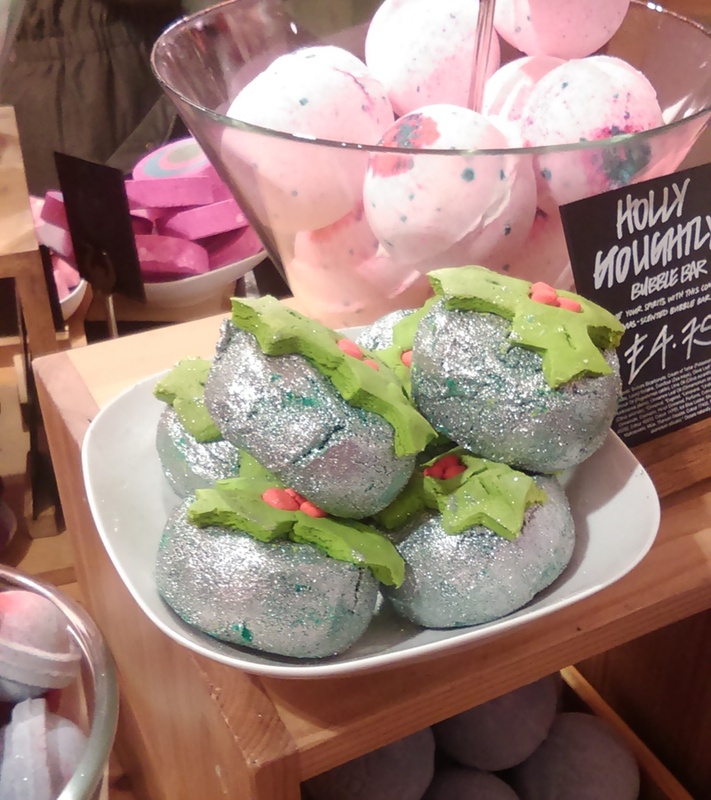 The one we didn’t get but i really like it so i snapped a picture again is very glittery and its called Holly Golightly (£4.75) This is also a bubble bar which has a festive spice fragrance is like bathing in a hot toddy, perfect for getting you in the Christmas spirit. You only need to use half of this because its so big! Obviously there are more products in the Christmas line but these are the ones i wanted to share with you. We all know about Snow Fairy and the like so i didnt think id need to tell people about that. You can purchase all of these products from lush.co.uk or from any Lush shop. What do you think of #LushChristmas? Love the idea of Hot Toddy Shower Gel, I bet it smells amazing…. I’m reading so many Lush posts lately, I think I’m going to have to treat myself to it all!! Ah I love Lush, need to get my hands on some products! I love all those bubble bars! They look so cute! Checking out your blog following yesterday’s #bbloggers chat. I am huge fan of Lush. The Dashing Santa notes are right up my alley, so I will definitelty get it. I also love Snow Cake soap, I think it smells totally amazing (plus it is so creamy!). Great post Andi! I was invited to the London launch but I unfortunately could not go but since then popped into one of their stores and the Christmas range looks amazing! As a huge fan of Lush I just wanted to buy everything! LOL! I love the sound of the Holly Golightly bubble bar though.